Now that Halloween is finished, let's crank up the holiday music and get busy planning for the Christmas holiday. Did you know there are about 53 days until Christmas? (Countdown link here.) So three of our design team girls rocked around the assignment and came up with some fun ideas to add some holiday cheer today here on the blog!! 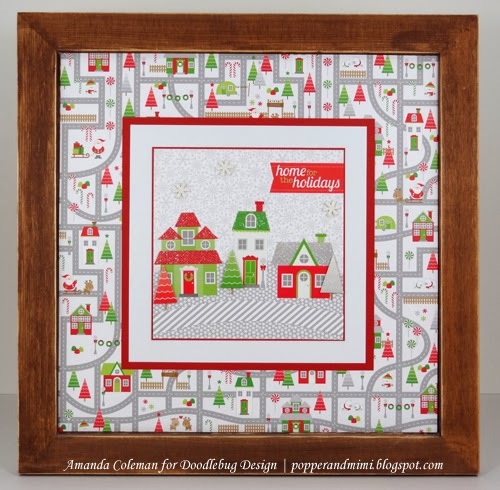 The home for the holidays collection from doodlebug design is just darling! The collection is filled with the traditional red and green, with the addition of grey and silver. Lots of sparkles! I attached the sugar-coated ornament sticker with the Christmas doodle twine so it appears to be hanging. 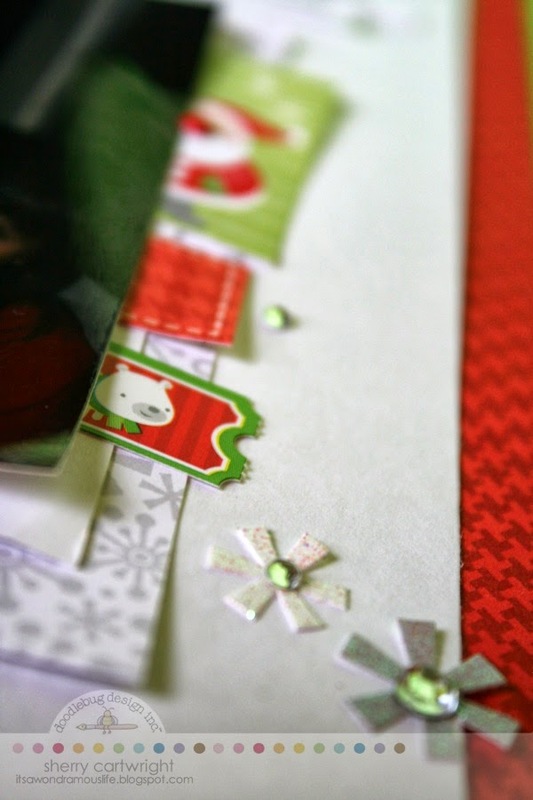 I added a grey title to pull in the silvery glitter and the snowflake paper behind the photo. I don't normally gravitate to the traditional colors of Christmastime, but this year I am embracing [and loving!] the red and green combination. I used a decorative brad from a past collection to pull in some lighter shades of color --- notice the light pink and green? The doodlebug design cardstock stickers and fancy frills are so much fun to add to layouts. Here, I've clustered some stickers behind my photo. The red stitched banner sticker quickly became a tab by hiding the notched bottom under the photo. The ticket border stickers are just the cutest thing, but I tend to collect them rather than use them. I tore only one off and used it in the cluster by the photo to mimic the golden ticket and add some whimsy. To finish off the layout, I added sparkly snowflakes and rhinestones. What is your favorite holiday color scheme? 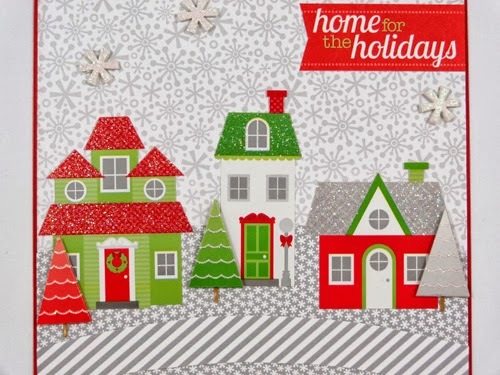 The Home for the Holidays street paper is so stinkin' cute it could be a piece of decor all on its own. I paired the street print with some house stickers to make a custom piece of 12"x12" home decor. Wanna know a secret? I adhered the paper to the frame with washi tape so I could easily swap out this scene for another holiday scene. 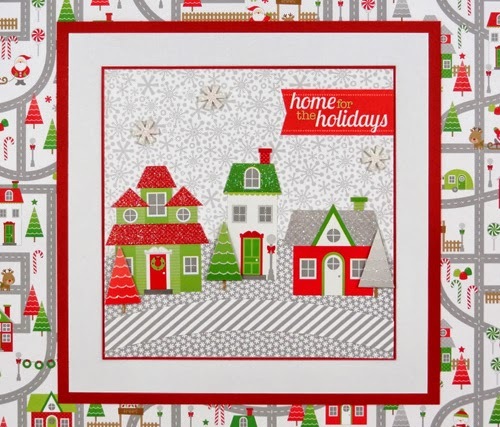 I created the centerpiece by layering house stickers and Christmas tree Doodle Pops on a 6"x6" background. I matted the scene with alternating layers of red and white cardstock. The glittery rooftops and snowflakes are so fun and festive. This happy piece of Christmas decor will grace my house for years to come. 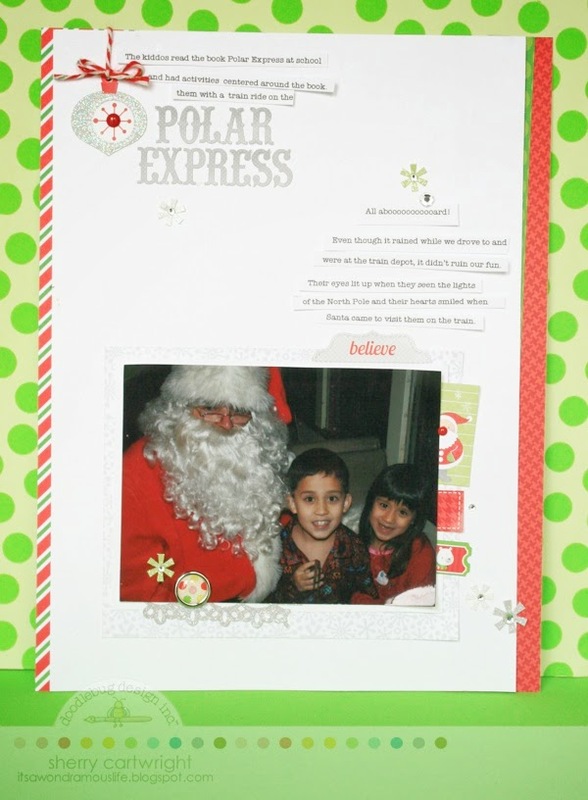 The inspiration for this layout started with two of the Simply Put cards. I layered the two onto a piece of "O Christmas Tree" paper that I cut down to 8" wide. Next, I centered and layered that piece onto a sheet of the "Deer Heart" paper that was cut to 9" wide and then used the "White Christmas Sugar" paper as the base paper. After machine-stitching around all of the layers, I placed my photo and began embellishing. With a snowflake die from my stash, I used it to cut three snowflakes from "Lily White Sugar Coated" Cardstock. I attached the snowflakes to the layout with foam adhesive and then added a 1.5" circle punched from the "Deer Heart" paper to the center of each. I then embellished with snowflake brads and cardstock stickers. I placed a journal sticker at the bottom of my photo and then tied on a double bow from the Christmas baker's twine. This collection is so cute. I love the traditional colors. I also add some Aqua/Teal and pink. Yikes only 53 days not nearly enough time to finish all the projects and gifts I'd like to make. Doodlebug your the best! I always find such great inspiration from your projects and blog hops.